Cale Makar of University of Massachusetts has been selected as the 39th recipient of the Hobey Baker Award, given to Division I college hockey’s top player. The sophomore defenseman, who will lead the Minutemen into Saturday’s NCAA final against defending champion Minnesota Duluth, ranks third nationally with 49 points. Makar, a Colorado Avalanche prospect, set UMass records for assists (33) and points. The smooth skater and passer anchored a defense corps that leads the nation in goals. Makar, a native of Calgary, Alberta, is the first UMass player to win the Hobey and earned the honor over fellow defensemen Adam Fox of Harvard and Jimmy Schuldt of St. Cloud State. Northeastern’s Cayden Primeau, who just signed his entry-level contract with the Montreal Canadiens, captured the Mike Richter Award as Division I college hockey’s top netminder. The son of former Philadelphia Flyer Keith and nephew of ex-Sabre Wayne posted a 25-9-1 record and the nation’s second-best save perentage (.933). The Hockey Humanitarian Award, given to the sport’s student-athlete who makes significant contributions to his/her team and community through leadership and volunteerism went to Wisconsin senior defenseman Jake Bunz. After traveling on a mission trip to Haiti in 2012, Bunz returned home and formed the Fond Blanc Foundation with the goal of providing funds, medical supplies, food and education. The foundation has gone from helping 40 to now aiding 60 orphans. The Foundaton also has helped provide education to more than 400 children. Bunz has raised more than $250,000. 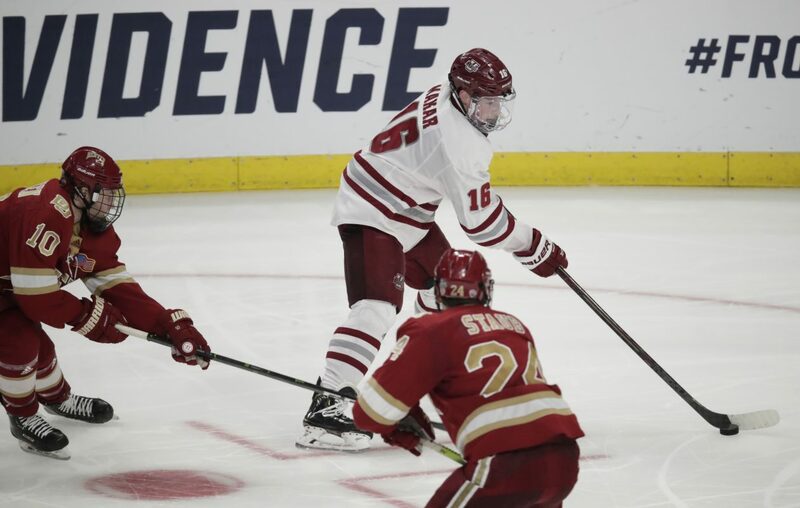 Three players received major penalties and game misconducts for delivering blows to head while body checking during the national semifinal between UMass and Denver. There was a fourth incident in the game. It went unpenalized, until Friday afternoon. The NCAA announced freshman forward Bobby Trivigno of UMass has been suspended for Saturday’s finale at KeyBank Center. The play occurred with 3:11 left in the third period when Trivigno hit Denver’s Jake Durflinger in the side of the head. UMass won in overtime, 4-3. In the NCAA Tournament, the Division I men’s ice hockey committee deals doles out supplementary discipline. The committee informed UMass brass before practice. Trivigno, who scored on the power play during Thursday’s overtime win over Denver, has 13 goals and 28 points in 39 games. "We'll rally around it," UMass coach Greg Carvel told ESPN.com. "Bobby is a really big piece, a really important player in this year's success. I feel badly for him, when you're 5-8, you have to protect yourself a little bit out there and unfortunately he crossed the line." Longtime Williamsville North High School and Amherst Youth Hockey Association Coach Bob Rosen received the American Hockey Coaches Association’s John Mariucci Award during a lunch-time ceremony in the Lexus Club at KeyBank Center. Rosen is one of the all-time winningest coaches in New York State. During his 29 seasons, he’s guided North to five state championships. He also coached 30 years with Amherst Youth Hockey, leading teams in the organization to four national championships. The John Mariucci Award is bestowed upon the secondary/high school association coach who best exemplifies the spirit, dedication and enthusiasm of Mariucci. In addition to being a legendary college coach at University of Minnesota, Mariucci was a driving force in the growth of hockey in the United States. Rosen was nominated for the award by his former college coach and longtime friend Brian Cavanaugh, former player and current Montreal Canadiens scout Nick Carriere and current Fredonia coach Jeff Meredith. All were among the more than 80 guests Rosen had at the gala for the special occasion. Here are this year’s Division I All-Americans. First team East: Primeau, goalie, Northeastern; Adam Fox, defense, Harvard; Cale Makar, defense, Massachusetts; Mitchell Chaffee, forward, Massachusetts; Ryan Kuffner, forward, Princeton; Nico Sturm, forward, Clarkson. First team West: Hunter Shepard, goalie, Minnesota Duluth, Quinn Hughes, defense, Michigan, Jimmy Schuldt, defense, St. Cloud State; Taro Hirose, forward, Michigan State; Patrick Newell, forward, St. Cloud State; Rem Pitlick, forward, Minnesota. While this is the second time the Frozen Four has come to Buffalo, this is the 11th time the event has come to New York State. That ranks just behind Colorado (15) for states that have hosted the event the most times. However, it should be noted that the first 10 Frozen Fours took place in Colorado Springs, Colorado before the NCAA started moving it around in 1958. Minnesota has served as host state 10 times, most recently last year. Massachusetts has had it eight times. Duluth came into the Frozen Four ranks fourth in team defense, yielding 1.95 goals per game. UMass came in ranked sixth at 1.97.